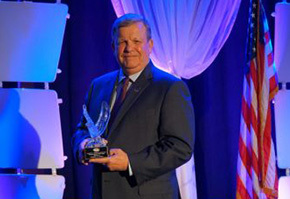 In honor of efforts to improve the quality of life for service members and families, Army & Air Force Exchange Service Director/CEO Tom Shull received the American Logistics Association's (ALA) Distinguished Service Award on during the group's annual convention in San Antonio. ALA is a nonprofit trade association that promotes, protects and enhances quality-of-life benefits for service members, military retirees and military families. "This is an extraordinary honor," said Shull, the first civilian to lead the Department of Defense's largest retailer. "For 123 years, the Exchange has been all in to take care of those who take care of us. Our Warfighters and their families deserve nothing less" Shull earned the ALA's Distinguished Service award for his leadership in transforming the delivery of promised benefits to service members and their families by leveraging proven business disciplines to grow market share and reduce costs.